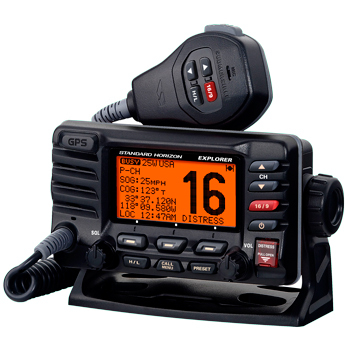 The Standard Horizon GX1700 Explorer GPS is a self contained DSC radio with an internal 12 channel GPS antenna. Communicate and have the safety of DSC without the extra installation time. 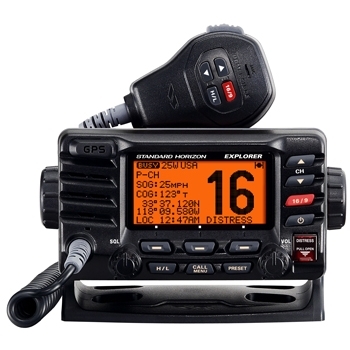 Get the benefits of a DSC VHF radio without the external GPS or wiring required with the Standard Horizon GX1700 GPS VHF radio. The GX1700 features an internal 12 channel GPS antenna that provides GPS position for DSC reporting. You can even view a compass, enter and save waypoints in the GX1700 Explorer GPS VHF, as well as display position, speed over ground, and course over ground right on the display. A noise cancelling microphone with channel up/down, 16/9, and H/L keys puts control right in your hand. 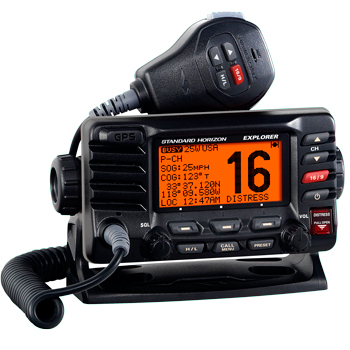 The Explorer is RAM3 remote mic capable to control all VHF, DSC functions at a second station. Communicating out in the deep blue has never been easier. An oversized Dot Matrix display can be adjusted for brightness and contrast for you to see easily if you can’t mount the GX1700 Explorer directly in front of you. Once you get the bold display in a position to see, it’s time to navigate. If you are having a hard time understanding what each channel is for, no worries, the GX1700 gives you have the ability to customize your channels so you can locate them and change them easily. Take the Standard Horizon GX1700 along with you on your next boating adventure to have the peace of mind that you have reliable communications and the safety of DSC at your fingertips. Internal 12 Channel GPS Antenna. Enter, Save, & Navigate To A Waypoint On The Compass Page. DSC Distress Function with no additional equipment or wiring required. Stainless Steel Mic Clip. 1 3/8 Wide x 1 13/16 Tall.